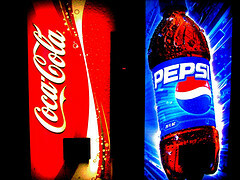 Which one do you prefer, Pepsi or Coca-Cola? According to the market share the split is somewhere around the middle. However, as Malcolm Gladwell mentions in “Blink“, in a random sip test, where people are asked to compare the two beverages based on a single sip, Pepsi is an outright winner. The reason is simple, we are not too good judging complex favours quickly but we can easily detect sweetness and Pepsi has more sugar. Similarly, following one of Joel’s favourite examples, most electrical retailers set their TV sets on display to the maximum brightness as we tend to judge the picture, at first glance, mainly by brightness. It seems to me, usability and graphic design follow similar pattern when it comes to web sites. We can’t quickly and easily evaluate usability but we are very quick to notice and judge the appearance. Therefore, when developing new websites, teams often focus on the graphical design, adding many shiny or elegant gadgets, rather than spending more time on improving the usability. After all, in the quick and often rehearsed demos, it is the functionality and appearance that will get noticed by the stakeholders. It’s the prominent design that will attract CEO’s attention, it is the choice of colours that might spark a discussion. In many cases however the ease of use and friendliness of your site is what will attract and, more importantly, keep your users loyal. It’s what will have the greatest impact on those, who will have to use your system every day. You may choose to impress them on the day of the release but then fail to keep them happy in the long run. So don’t just bloat your application with sugar, providing poor user experience under a shiny veneer leaving the users with a nasty after-taste. Delight your customers with applications so easy to use that they will be happy to keep coming back.